Saravana Bhawan is my go-to restaurant chain for South Indian delicacies and while they aren’t the best place for South Indian food in Delhi. They are good and more importantly, consistent in their service, quality and taste of food. 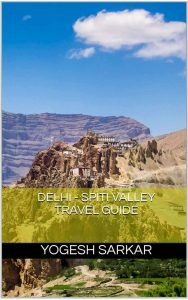 I have already eaten at their Karol Bagh and Connaught Place outlets. However, their Connaught Place outlet usually has a waiting at dinner time and I hate waiting for tables at restaurants. So last night, we decided to checkout Saravana Bhawan outlet at Janpath. 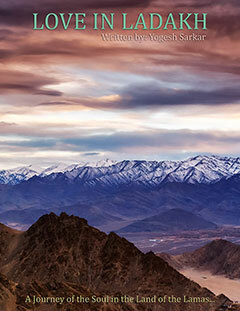 In terms of looks and space, it is pretty much the same as their Connaught Place outlet. When we reached there around 8:30 pm, it was almost full. However, there were still a few tables available and we didn’t had to wait for a table and walked right in! Just like their other outlets, service was fast and courteous, even though the place was nearly packed with patrons and staff was extremely busy. I guess most restaurants in NCR can learn a thing or two from Sarvana Bhawan, when it comes to managing customers. RD and I were in a mood to try something different initially. So she ordered a Corn Cheese Uttapam, while I ordered a Spicy Kalan Dosa. 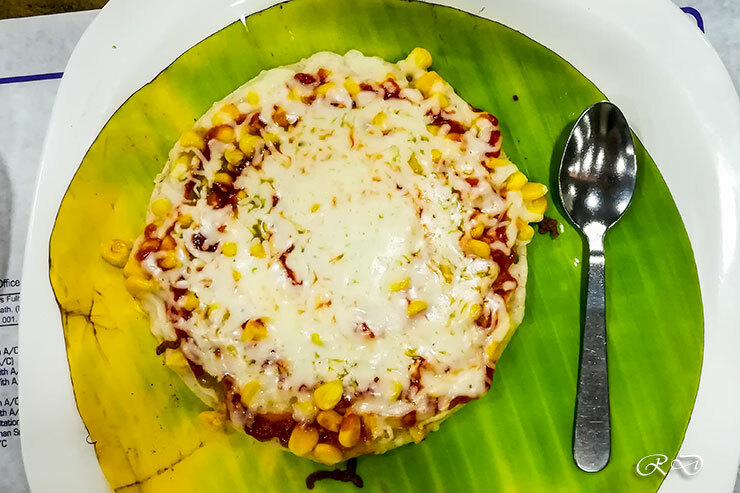 Corn Cheese Uttapam turned out to be a South Indian variant of pizza and in RD’s words, a kiddish attempt. It was sort of bland, but different nonetheless. I guess it should be good enough for kids who insist on having pizza on family outing to South Indian Restaurant. Though a proper pizza is miles ahead and so is a traditional uttapam! 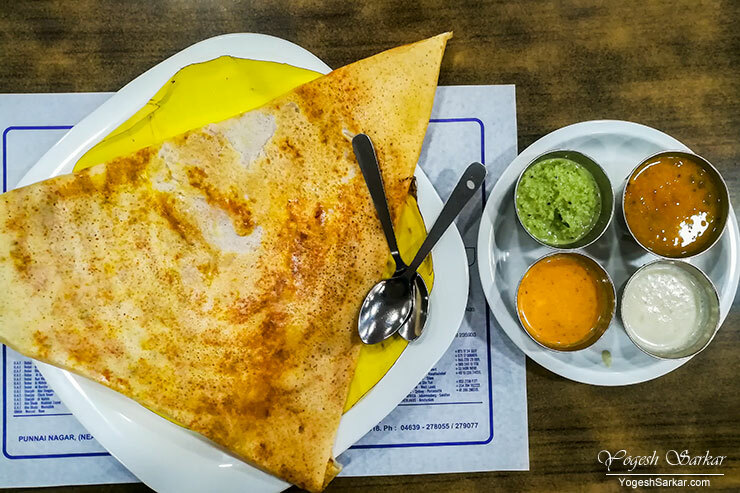 Spicy Kalan Dosa, on the other hand, turned out to be absolutely delicious and is now my favorite dosa to order at Saravana Bhawan. Stuffing apart from the usual onion and potatoes, included mushrooms and even though it was a little spicy, it was more chat-pata than spicy! The stuffing was spread out nicely throughout the dosa so it could be eaten without the usual assortment of chutney and sambar. Though with the spicy chutney and sambar, it tasted even better! RD had ordered Pineapple juice as well and even though it tasted a bit refreshing, it was too watery with fairly less sweetness than I expected and wanted. 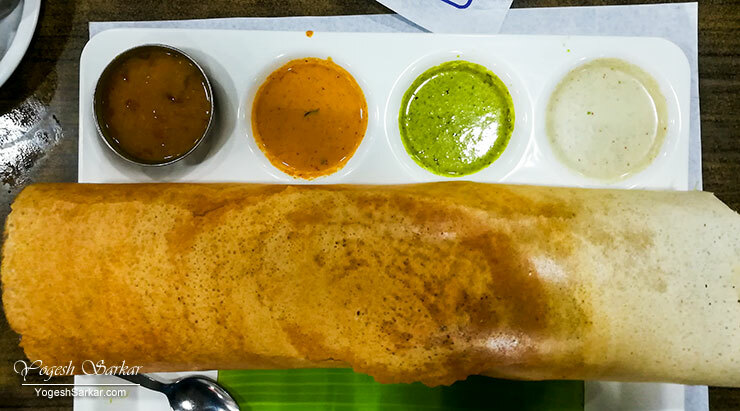 Since we weren’t yet full, we decided to order the masala dosa. While it usually tastes good, today, it felt bland. I am not 100% sure if it was due to lack of spices and salt or the effect of eating spicy kalan dosa earlier. Whatever the case might be, I am going to avoid masala dosa now and stick to spicy kalan dosa in future. After a fulfilling meal, we got the Rava Kesary (Sooji Halwa) packed for home and it was extra sweet and had little too much ghee in it. Though some people (including RD) like it that way. However, I prefer halwas a little less sweet and with ghee which is there in the taste, but not visible on the plate! The final bill for Kalan Dosa, Corn Cheese Uttapam, Pineapple Juice, Masala Dosa and Rava Kesary came out to be Rs. 745 (including 5% GST). For a delicious and hearty meal, it seemed like a good deal.